Types of Art: Due to the diversity of the Igbo people, it is impossible to generalize about a pure Igbo art style, which has characteristically been representative of numerous geographical regions. 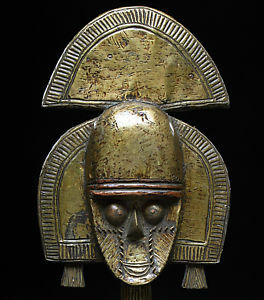 It could be said, though, that most Igbo do carve and use masks, but the function of these masks vary from village to village. They are famous for Mbari architecture. History: It is believed that the Igbo originated in an area about 100 miles north of their current location at the confluence of the Niger and Benue Rivers. They share linguistic ties with their neighbors the Bini, Igala, Yoruba, and Idoma, with the split between them probably occurring between five and six thousand years ago. The first Igbo in the region may have moved onto the Awka-Orlu plateau between four and five thousand years ago, before the emergence of sedentary agricultural practices. As this early group expanded, so too did the Igbo kingdom. The earliest surviving Igbo art forms are from the 10th century (Igbo Ukwu), and the fine quality of those copper alloy castings suggest that Igbo society had already achieved a level of technology rivaling contemporary Europeans. Economy: The majority of Igbo are farmers. Their staple crop is yam, and its harvesting is a time for great celebration. They are able to produce yam efficiently enough to export it to their neighbors. With the assistance of migrant labor, they also harvest the fruit of the palm tree, which is processed into palm oil, and exported to Europe in large quantities, making it a fairly profitable cash crop. Political Systems: The Igbo are a politically fragmented group, with numerous divisions resulting from geographic differences. There are also various subgroups delineated in accordance with clan, lineage, and village affiliations. They have no centralized chieftaincy, hereditary aristocracy, or kingship customs, as can be found among their neighbors. Instead, the responsibility of leadership has traditionally been left to the village councils, which include the heads of lineages, elders, titled men, and men who have established themselves economically within the community. It is possible for an Igbo man, through personal success, to become the nominal leader of the council. Religion: As a result of regional and political fragmentation, which is mirrored in the several distinct languages traditionally spoken by the hundreds of different village groups, it would be reductionist to attempt to illustrate the traditional religious practices of the Igbo as a whole. Before the influence of Europeans and Christian missions, however, most Igbo practiced some form of ancestor worship, which held that in order to gain success in this world, one must appease of the spirits of the deceased. This might be accomplished in any number of ways. One of the primary ways of showing respect for the dead was through participation in the secret men's society, Mmo, which is the name used only in the northern part of Igbo land. In other parts, similar societies exist under different names. The second level of initiates was responsible for carrying out the funeral ceremonies for the deceased and inducting the departed spirits into the ebe mmo, so that they would no longer cause mischief in the village.